Since the founding Congress of Paris, culture has been at the heart of UCLG’s policy agenda. That is why, following the success of the first and second UCLG Culture Summits, and considering the growing importance of culture in the framework of sustainable cities, the Executive Bureau of UCLG decided to convene a third UCLG Culture Summit in 2019. As the call for candidacies to host the 3rd edition of this Summit ended, the World Council of UCLG decided in Hangzhou (China) in December 2017 that the host city would be the Autonomous City of Buenos Aires (Argentina). The UCLG Culture Summit is the main meeting point at global level of cities, local governments and other stakeholders that are committed to the effective implementation of policies and programmes on culture and sustainability. The Culture Summit of Buenos Aires is based on the results of the previous Summits, held in Bilbao in 2015 with the theme “Culture and sustainable cities”, and in Jeju in 2017 with the title “Commitments and Actions for Culture in Sustainable Cities”. The Summits show that cities are leading the way in recognizing the absolute necessity of cultural factors as a key dimension of sustainable development. This is why the third UCLG Culture Summit will be called Culture in Sustainable Development. Cities Lead. The 3rd UCLG Culture Summit will take place in Buenos Aires (Argentina) on 3-5 April 2018. The Summit is a forum for knowledge-sharing, peer-learning and networking among cities and local governments. It expects to gather approximately 500 participants from all world regions. Over three days, the Summit will combine plenary sessions, smaller and thematic parallel sessions, project presentations and networking spaces. The third Summit will address the place of cultural aspects within the global agendas on sustainable development (namely, the Agenda 2030 and the Sustainable Development Goals), as well as how to strengthen the position of culture in their implementation. The document entitled “Culture in the SDGs: a Guide for Local Action” provides guidance in this area. Don't miss the new Summit website! UCLG and its Committee on Culture is pleased to announce to all its members the launch of the website dedicated to the next Culture Summit: www.uclg-culturesummit2019.org. The site provides information on the key topics to be discussed at the Summit, the programme to be updated together with the available cultural visits. In the section "Culture 21" and "Buenos Aires" you will learn more about the host city of the event and UCLG's role in promoting culture in sustainable cities. 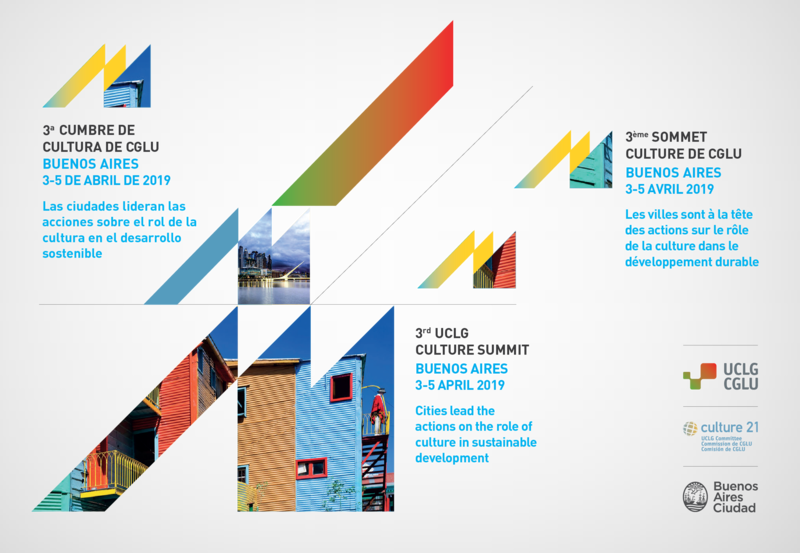 Read: 3rd UCLG Culture Summit - Background document.